Linda P. Singer was born in Brooklyn, New York to Edna and Irving Shapiro. At the age of two years they moved to Astoria where her parents purchased a candy store and where she was faced with a great deal of antisemitism from children in the neighborhood. When her father became very ill, the family had to give up the candy store and moved to Rockaway. Unfortunately, he passed away when Linda was only 15 years old. Linda and her mother moved back to Brooklyn where her mother went to work and Linda attended Lafayette High School and went on to Brooklyn College for her Bachelor’s Degree and later her Master’s Degree in teaching. Her first job was in East New York. When her student teacher invited Linda to her engagement party she luckily agreed to go since this is where she met her future husband, William L. Singer. They dated, got engaged and married within one year. In 1978 they expanded their family with the adoption of their son, Stuart, from Ecuador. In 1990 Bill joined JWV Post 24 and, because this Post had no Auxiliary, Linda joined JWV Auxiliary #415. 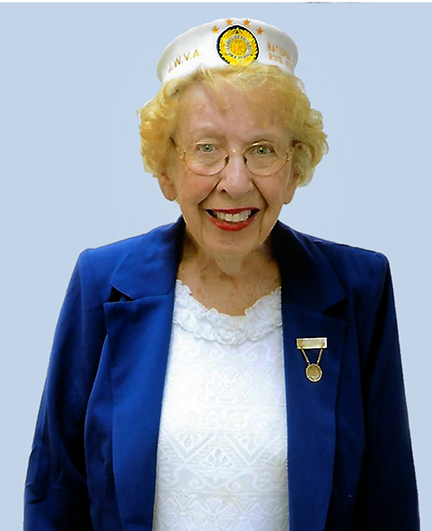 Linda answered a call for help from Auxiliary #793 and became their President until they disbanded. When Bill’s Post also disbanded they joined Post & Auxiliary #648. Linda went up the chairs and served as President for several years, then moved up to Queens County where she served as President for many years. After moving up to the Department of New York, she went up the chairs and served as Chairman of many Committees, eventually becoming Department President. She served as President for three terms, answering the call of her Department. At National JWVA Linda served as Chairman or committeeman for Aid to Israel, Double Chai Club, Fundraiser, Child Welfare and was always available to help wherever and whenever needed. Linda went up the Chairs at National and is proud to now have achieved the highest Chair, that of National President.